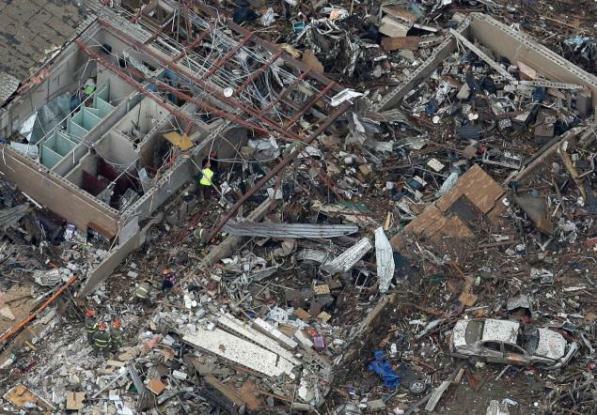 Aerial view of Plaza Towers Elementary School in Moore, OK, where IAM member George Rogers found his 9-year old son alive after a mile-wide tornado destroyed the structure. On May 20, the town of Moore, OK was hit by a monster EF5 tornado, with wind speeds in excess of 200 mph. Since 1998, Moore has endured three tornadoes, including one in 1999 with wind speeds of 318 mph, the highest ever recorded on Earth’s surface. During the hour the latest tornado was on the ground, 13,000 homes were destroyed or heavily damaged and 22,000 people were left homeless. IAM Local 850 in Oklahoma City represents over 500 members under several contracts in the area. Nearly 800 IAM members of Airline and Railroad locals also work in the affected area. At least nine IAM members’ homes were a total loss, with 26 suffering significant damage. According to District 171 Directing Business Representative Tony Bennett, there may be more, but communications are yet to be fully restored. 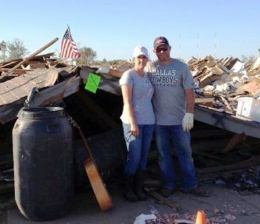 Oklahoma Local 850 member George Rogers and his wife Jamie consider themselves lucky after an EF-5 tornado demolished their home in Moore, OK.
One Local 850 member, George Rogers, was in the middle of the storm as it happened. An IAM member since January 2009, Rogers is a general maintenance worker for Southwest Facilities Support at the FAA Center in Oklahoma City. Plaza Towers Elementary School was among the hundreds of buildings in Moore that was totally destroyed. As soon as the storm passed, Rogers ran for the school. “The building with my son’s classroom was separate from the rest of the school, and it was in splinters,” said Rogers, who was the third person on the scene at Plaza Towers. “I was calling my son’s name, and we were looking for survivors in the rubble. Someone saw the arm of a child sticking out of the debris, and we pulled out a child, and then another one. We’re trying to remove debris, and we had all kinds of wires hampering us. I pulled out my Leatherman tool, and we started cutting through the debris. Southern Territory GVP Bob Martinez Jr., asks the IAM membership to support the people of Moore as they prepare to clean up and rebuild. The IAM Community Services Department is accepting tax-deductible donations to help with the relief effort. Checks should be made out to “I Am Assistance” and include the mailing and email address of the sender. Send all donations to IAM Headquarters at 9000 Machinists Place, Upper Marlboro, MD, 20772. Members are also encouraged to donate to the Red Cross Disaster Relief Fund by visiting redcross.org, dialing 1-800-REDCROSS or texting REDCROSS to 90999 to make a $10 donation.